This is my new favorite pizza. And The Phoenix’s too. We had it last week and seriously cannot wait to have it again this week. I wasn’t sure how it’d go over with our guests too, so I made another more traditional pizza just in case. But it was barely touched. 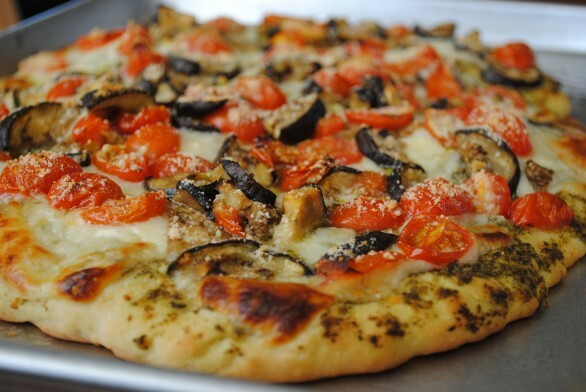 And this one, Roasted Eggplant and Tomato Pizza, aka my new favorite pizza, was devoured. I even pureed up the extra roasted eggplant, tomatoes and garlic for my baby and he ate it up like there was no tomorrow. Seriously, you gotta try this one. It’s amazing. The pizza dough is simple to prepare and can, well, should be made ahead of time. Plus, it makes two crusts and will save for multiple days in the fridge and actually gets better over time. So you could have this twice in a week. And I bet you wouldn’t get any complaints, even from your kiddos. To make the crust: Sprinkle yeast over 1 1/2 cups warm (not lukewarm) water. In a mixer, combine flour and salt. With the mixer, fitted with the paddle attachment, running on low speed, drizzle in olive oil until combined with flour. Next, pour in yeast/water mixture and mix until just combined. Coat a separate mixing bowl with a light drizzle of olive oil, and form the dough into a ball. Toss to coat dough in olive oil, then cover the bowl tightly with plastic wrap and store in the fridge until you need it. It is best to make the dough at least 24 hours in advance, and 3 or 4 days is even better. To make the pizza: Preheat oven broiler. Slice the eggplant thinly. Sprinkle both sides with kosher salt and place into a strainer in the sink. Allow to sit for 20 to 30 minutes. Rinse eggplant lightly in cold water, then pat the slices dry between layers of paper towels. Slice grape tomatoes in quarters lengthwise and toss into a bowl with minced garlic. Put mozzarella in freezer for a few minutes to make cutting easier, then slice mozzarella very thinly. Drizzle olive oil on a large baking sheet and use fingers to coat thoroughly. Remove HALF the pizza dough from the bowl. Stretch pizza dough into a large rectangle, pressing with fingers to finish forming. Dough will be very thin. Lightly drizzle a little olive oil on the dough and use fingers to spread. Spread a thin layer of pesto all over dough. Lay mozzarella slices over the surface of the pesto. Spread vegetables all over the surface of the cheese. Top with parmesan cheese. Bake for 10 to 12 minutes, or until crust is golden brown and the cheese is bubbly. Remove from pan and slice with a pizza cutter. Serve immediately. I was just wandering if you ever use whole wheat flour for this. I’ve tried to replace white flour with whole wheat in other recipes, but I find them too dry. Any ideas or suggestions? I’ve tried it a few different ways, and we all liked the crust when I made it with half all-purpose and half whole wheat flour. The texture changes a bit, but my family liked it like this and it’s usually how I make it now.